Implementing Spring.NET WCF services is fairly straightforward. 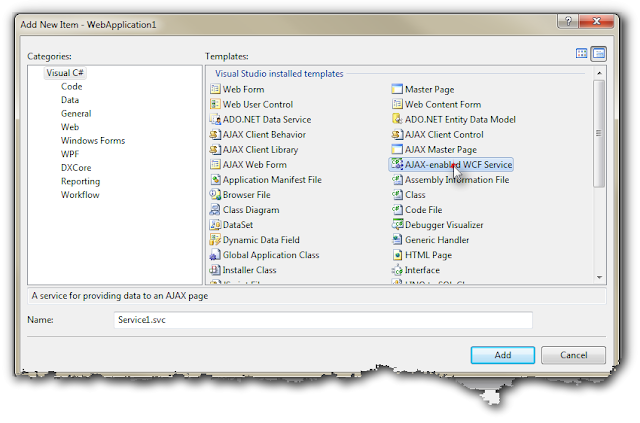 Implementing MS Ajax WCF services is also straightforward, if you pick the right New Item to add from Visual Studio. 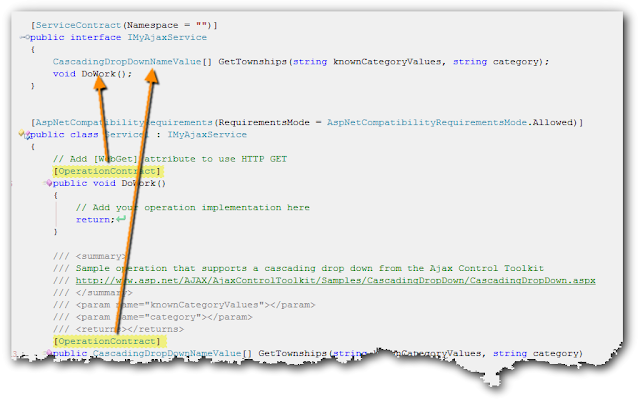 The complication comes in when you want a Spring.NET WCF service that handles calls from Microsoft Ajax controls. This method will let you add them. Step 1. Add new "Ajax-Enabled WCF Service"
Step 2. Create your methods, test and make sure all base functionality is working. This sample is for a CascadingDropDown control from the Ajax Control Toolkit, but any control will work. Step 3. Introduce an interface to use for the methods. Spring.Net requires an interface, and this is the crux of the problem. Here I've created IMyAjaxService. Step 7: Test. 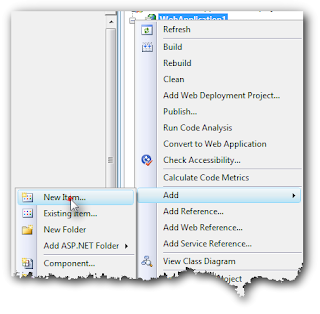 The test should work, without dependency injection from Spring.Net. Now we have a WCF service that responds to Ajax, but has the interface definitions just the way Spring likes them. This will get Spring.Net into the activation pipeline for the service. Lastly, you'll add the new object to spring configuration. It is CRITICAL that the OBJECT ID MATCH THE SERVICE NAME FROM WEB.CONFIG. The Spring.Net documentation mentions this, but I don't think they mention it very loudly. The type information is exactly as you'd expect: the type for the WCF service class.